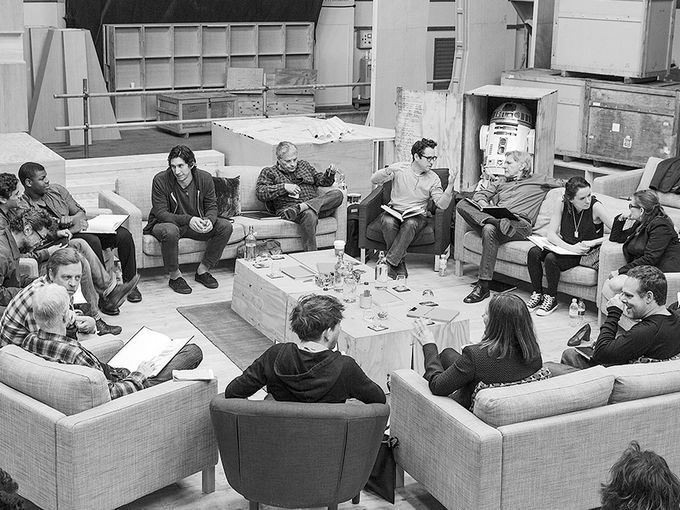 The cast has FINALLY been announced for J.J. Abram’s newest installment of the Star Wars saga! Look! Even R2D2 is there! Can’t tell who everyone is? No problem; I’m here to help! The the original cast members (or as I like to call them: The Jedi Trinity) are BACK! That’s right, Harrison Ford, Mark Hamill, and Carrie Fisher have all signed on to reprise their roles from the original (and, in this blogger’s opinion, the BEST) 1970’s films! But who are the rest of these young whippersnappers? Glad you asked! Neither Dementor nor Storm Trooper scare me. 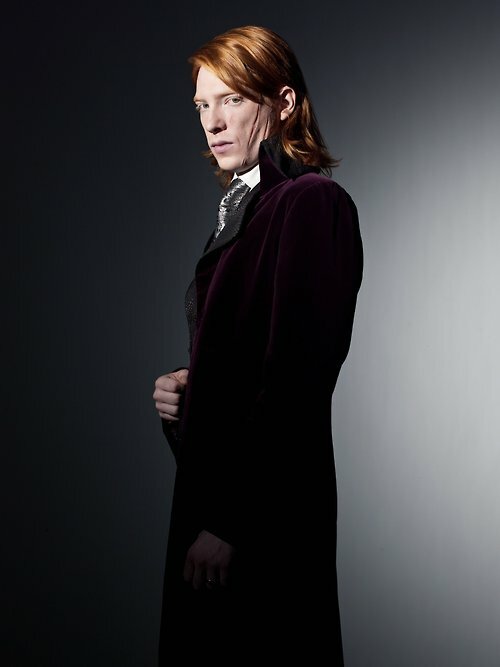 Dom, AKA Bill Weasley, will be turning in his wand for a lightsaber come December 2015! 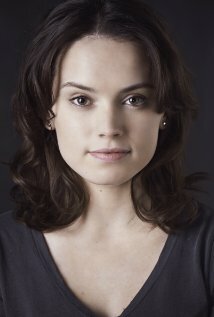 IMDB doesn’t list his character’s name, but my guess is he is either the spawn of Han and Leia or one of Luke’s littles. 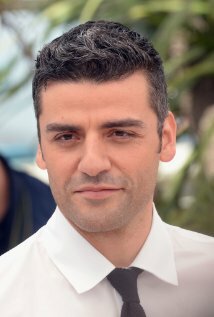 Best known for his role on HBO’s Girls and Inside Llewyn Davis, its unclear who Driver will be playing as well. 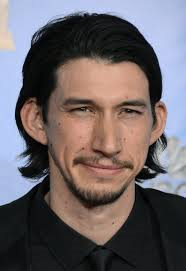 Although, he really reminds me of a younger, less crazy-eyed Peter Mayhew. Maybe he’s one of Chewbacca’s pups…? This cute-as-a-button brunette is just about as adorable as her name. But, I feel as though there’s some fierceness behind those baby brown’s. Maybe she’s a little Leia…? Ridley has only has about 6 or 7 acting projects under her belt, but something tells me that Star Wars is going to catapult her to stardom. 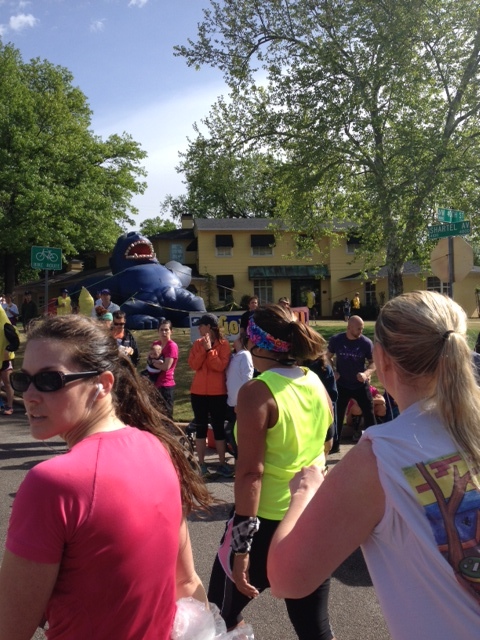 This weekend was the 14th Annual Oklahoma City Memorial Marathon. 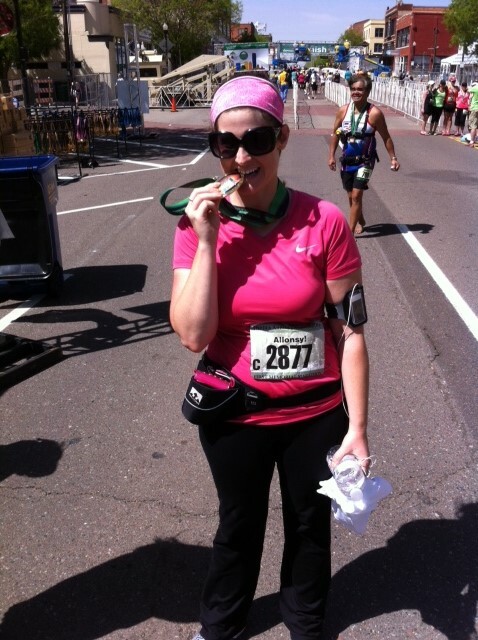 And, as you know, completing a marathon is one of the things on my 30 by 30 list. I’ve been training with my sister for the past 4 1/2 months and the day FINALLY came. Saturday night, I was super nervous. We picked up our packets the day before and I was sitting in my recliner, looking at the course map. I could not believe it. My stomach started to churn and so many thoughts raced through my head: Can I do this? Can I actually do this? What if I die?! I went to bed Saturday night confident that I could do the marathon. After all, I had run 20 miles just a few weeks before and I did fine! I was a little sore the next day, but I survived. And on race day, adrenaline kicks in and really takes your endurance to the next level. The race was set to start at 6:30 a.m. Sunday morning. I got up at 5:00 to pump and get dressed. The news was on and the weatherman was predicting a lot of rain, hail, and possibly a tornado. I still didn’t worry. Two years ago, I did a half marathon in the rain and I did just fine! I’d be okay. We got to the race and I could feel the excitement. There were so many people! 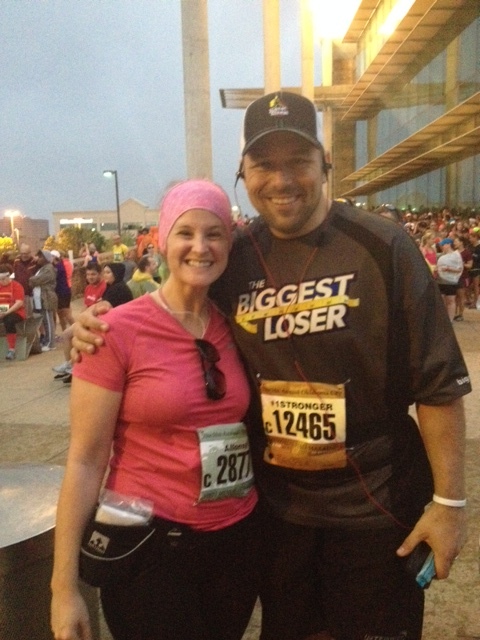 I even met a Biggest Loser! As the morning went on, the weather started getting worse and worse. We were forced into a parking garage where we learned we’d be waiting for the next TWO HOURS. Get out of my way. Seriously, MOVE! Get. Out. Of. My. WAY. Oh geez, that was a big puddle. Are my socks wet? No, they’re fine. Whew! Holy crap, that’s a steep downward hill. I’m going to slip. I’m going to slip. I’m going to twist my ankle and fall. You didn’t fall, good job. Where is the *&^%$#@ water stop?! Okay, first water stop and bathroom break. *Sigh* I feel MUCH better! I can do this! Ugh. Is this “Gorilla Hill” up here? Crap, it is. I hate this frakking hill. Better wave BB down and let her know I’m walking. Might as well take a picture. I want to quit. I want to quit. Tell your sister you want to quit. Why is it so $%^# hot?! There’s a medical tent. Just stop and tell them to take you to the finish line. Me (crying and thinking): I’m crying but I can’t produce any tears because I’m so dehydrated! I’m like Howard! I feel the blisters on my feet. Every step is agony. I’m wielding my arms like a granny power-walking at the mall. The sun is beating down on me and I realize I haven’t put on ANY sunscreen. I actually think: I’d rather give birth, right here, right now on this asphalt than do this! Get to the finish line so you can use your breast pump! We meet a woman we’ve been keeping pace with the whole time. We start talking. 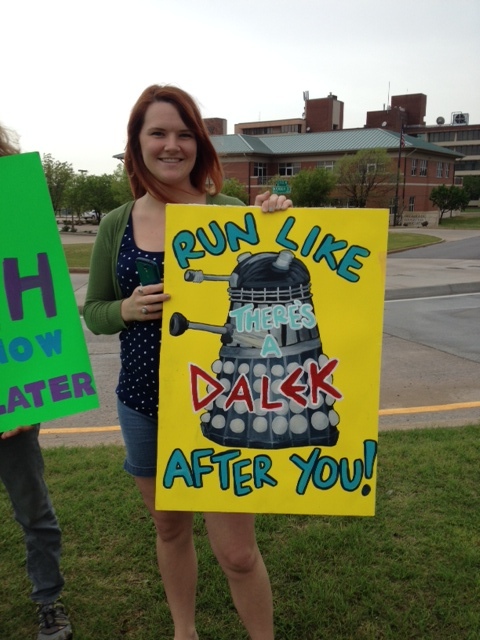 She’s 45, from Little Rock, AR, and this is her second full marathon. We talk about our aches, our pains, how we weren’t expecting it to be so hot (88*!) and how ready we are for the finish line. We talk the rest of the way. I did it! I freaking did it! I completed a marathon! Thank you, God, for helping me get through this! And I’m sorry for swearing in my head so much. I’m NEVER doing that again. Like, EVER. But I did it. I finished it. And, actually, I’d say it was worth it. The months of waking up early every Saturday to do long runs; the solo runs through the neighborhood in temps of 30*; the sore joints and muscles…it was worth it. Why? Because I achieved a goal. Seven months ago, I was giving birth. Seven months ago, I never thought I’d be able to do this. But I did. I am a marathoner. I am a Finisher. I’ve spent the majority of the day carbing up for my marathon on Sunday. And let me tell ya…eating is F-U-N! I think I’m going to list it as one of my favorite hobbies on Facebook after today. I’ve got gobs of geekery to share with you so let’s dive right in! 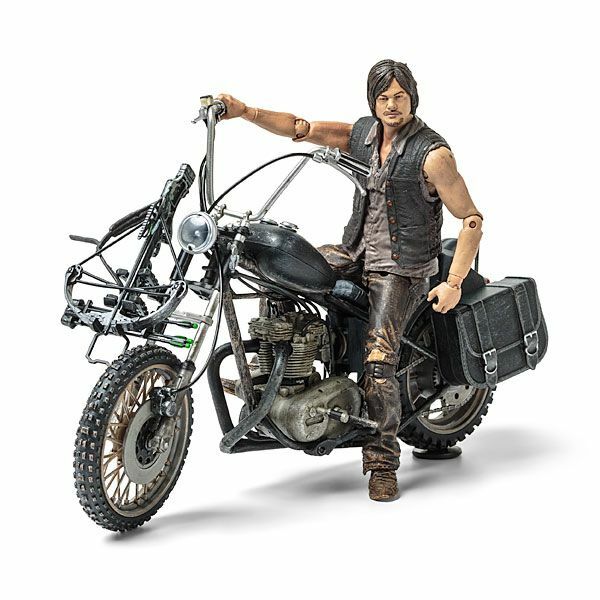 First, man-oh-man is there a plethora of movie news out about some highly-anticipated films! We all know Henry Cavill is Superman and Ben Affleck with be donning the cowl in Zac Snyder’s Superman vs. Batman but it looks as though there’s a third party being thrown into the ring! 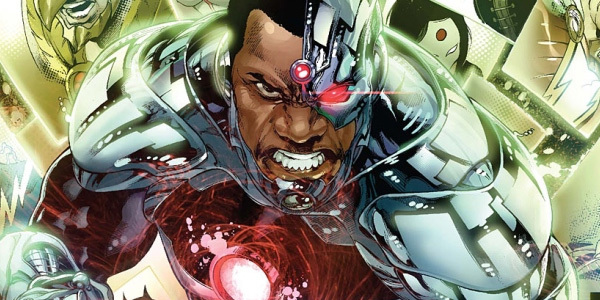 That would be Cyborg–a character first introduced in the comic book back in 1980–who, after a tragic accident, becomes a mechanized superhero! Fun fact: the actor playing Cyborg has also been rumored to be in the next installment of the Star Wars films! Where my 80’s girls at? get ready to squeal with joy, because Jem and the Holograms are reuniting! EEEEEEEE! That’s right people, our favorite Hubba Bubba-hued rockstar is making it to the big screen with a live-action movie titled–what else?–Jem and the Holograms! If the leading lady looks familiar, its probably because you’ve seen her in such gems (pun TOTES intended) as Sharknado and Ace Venture, Pet Detective Jr. Yes. You read that right. 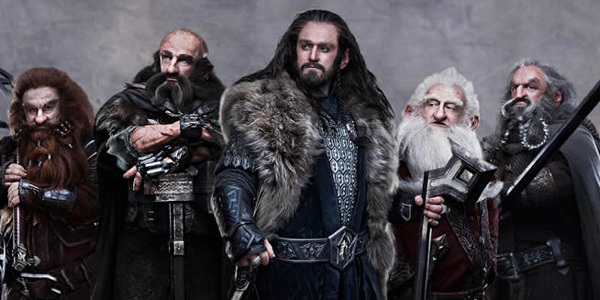 I am counting down the days until the final Hobbit movie makes its debut. However, I may have to re-do the screen print t-shirts I’ve made because P.J. (AKA, Peter Jackson) has decided to change the title from The Hobbit: There and Back Again, to The Hobbit: The Battle of the Five Armies. Yeah. I’m serious. Have a great weekend, peeps! And keep your fingers crossed the marathon isn’t a washout! I’ve stress-eaten all the Easter candy in the house, there’s a HUGE chance of severe weather for the marathon on Sunday, and I got very sad news about a childhood friend. Needless to say, I’d like a reason to laugh. And thankfully, I found two! Since I didn’t do a Try It yesterday, I thought I’d make up for it today! And trust me, you are going to LURVE it! What is the most magical food in the entire world–nay–galaxy? No, not Nutella. We can all agree that everything’s better with bacon. 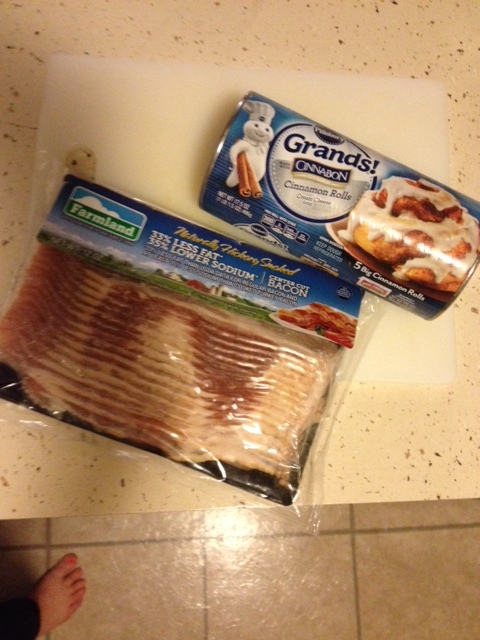 Bacon has always been a breakfast staple, and now its made its way into your favorite breakfast pastry! 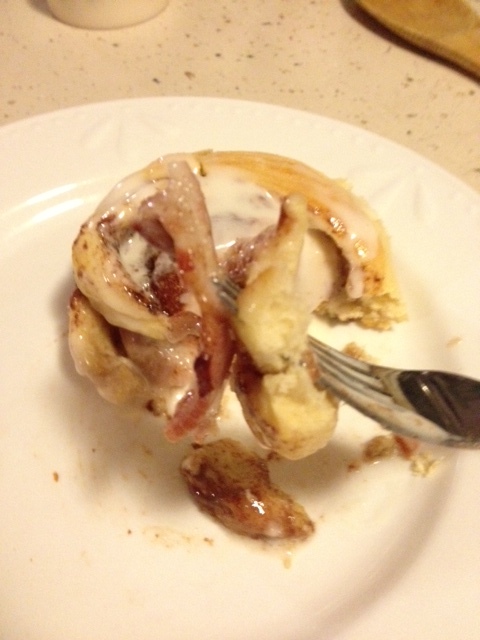 That’s right: today’s Try It is cinnamon rolls with a bacon-y center! Then, roll up and bake! 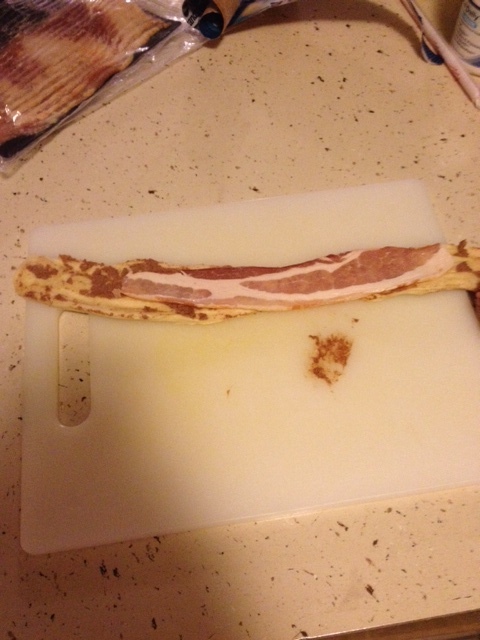 You know how people say that ANYTHING is better with bacon? Umm…well…I don’t think they’ve tried this. It wasn’t as good as I had hoped. 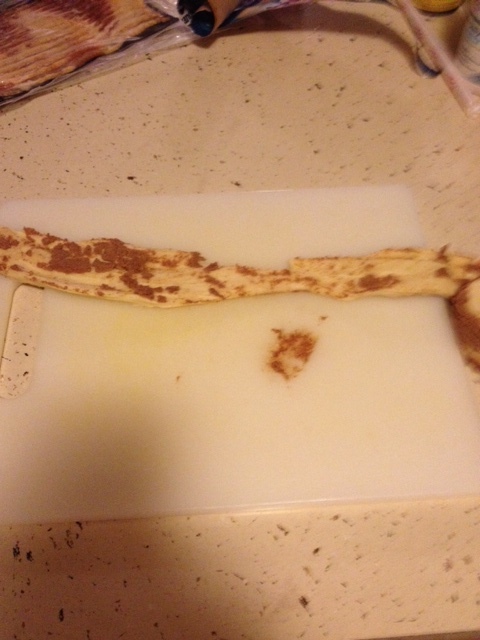 I’m pretty sure the bacon wasn’t all the way cooked. I took one bite and sort of gagged. I was so sad! I really wanted it to be the greatest thing I had ever eaten! But, sadly, it was not. Oh well. Guess I’ll just add it to the collection of Pinterest Fails. Happy Earth Day, green peeps! One of my resolutions this year was to be more environmentally conscience. 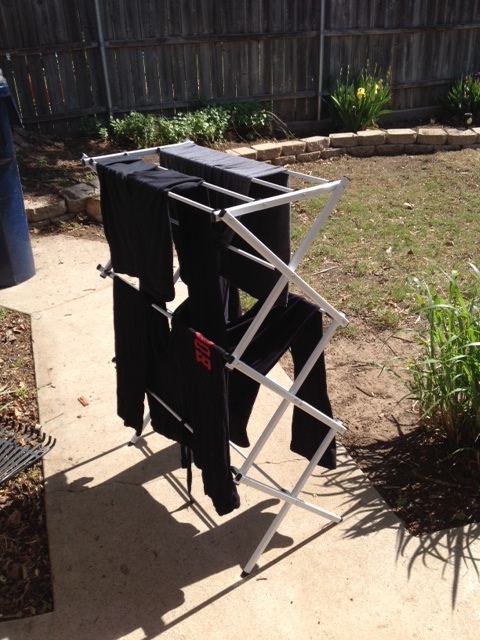 We already use cloth diapers, cloth napkins, and eco-friendly detergent but I wanted to do more. The goals have kind of fallen by the wayside because things have been hectic around here. But, today’s holiday has renewed my fervor! 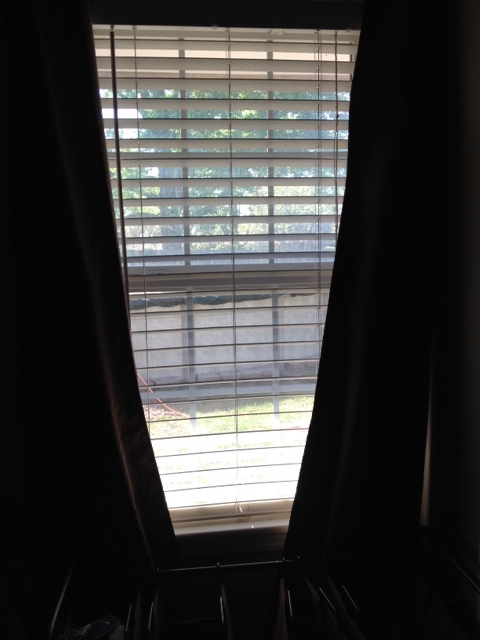 I turned off all the lights in the house and opened up the shades and curtains to work by sunlight. And even Hermione go in on the Earth Day action! 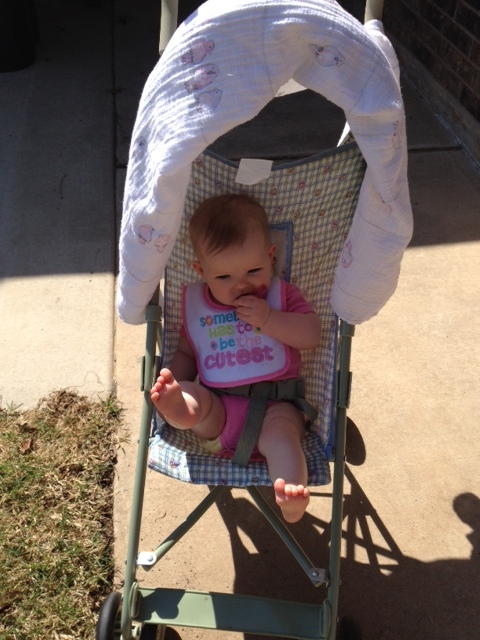 Her babysitter (my aunt) lives only a few blocks away, so we commuted by stroller today! Did you do anything to help the environment today? Got any good tips?